Thousands of people opposed to Britain delaying its departure from the European Union have marched through central London as MPs rejected Prime Minister Theresa May's Brexit deal for a third time. On the day that Britain was originally meant to be leaving the EU, large groups gathered in outside parliament waving Union Jack flags and chanting, "Out means out". Protesters who expected to celebrate Brexit outside Parliament were instead left confused by the latest defeat of Mrs May's plans. Some cheered when the Prime Minister suffered another Commons defeat when her Withdrawal Agreement was rejected, on the day that was the slated deadline for the departure. But others were left fearing it meant a new EU referendum was now on the cards and were frustrated by a delay. The reaction of many protesters reinforced how confusing the Brexit process has been, with some wrongly believing it was a third "meaningful vote" on Mrs May's deal. Far-right Leave activists spoke at a separate meeting being cast as "a make Brexit happen" rally in Whitehall near Mrs May's office in Downing Street. Police said they were prepared for potential trouble, although the atmosphere was festive. Andy Allan, 58, who was carrying a red and white St George's flag, predicted that there could be unrest modelled on the "yellow vest" protests that have rocked Paris for the last few months if Britain fails to leave the EU. Former Ukip leader Nigel Farage, Wetherspoon founder Tim Martin and broadcaster Julia Hartley-Brewer all spoke at the "Brexit Betrayal" rally. Scotland Yard was compelled to dismiss as "baseless and false" suggestions from current Ukip leader Gerard Batten that water cannon could be deployed at protests to "provoke Brexiteers". Westminster Council said it was aware of up to 13 separate scheduled protests and the Metropolitan Police said "appropriate policing plans are in place". 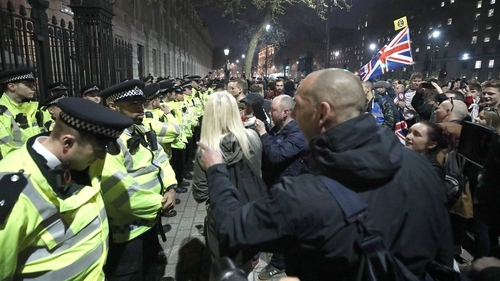 Scotland Yard said: "We will always provide a proportionate policing plan to balance the right to peaceful protest, while ensuring that disruption to communities is kept to a minimum."